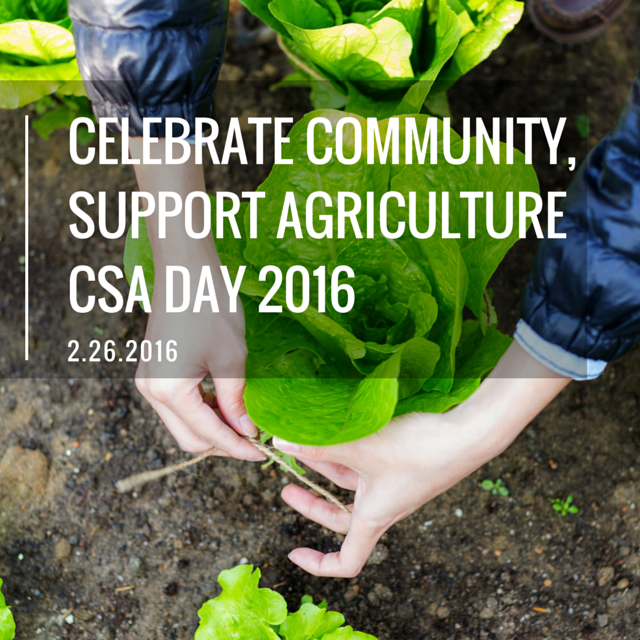 Friday, February 26 is national CSA Signup Day. Why? Well the good folks at Small Farm Central did the research and found that this is a prime signup day for CSA farms nationally. We think national CSA Singup Day is a great idea to get the word out about Community Supported Agriculture (CSA) and its importance to the larger food system in America. We believe CSA is a key part of America's food security future and is unique in how it connects people to their food--members buy shares in a farm and receive the fruits of the farm's labor in return. It's a rare partnership that requires the direct participation of folks who truly care about where their food comes from and how it is grown. February is a great time to be spreading the word, as most CSA farms rely on early-season signups to fund the important start-up activities needed to get the farm up and running each year. Like other farms, we appreciate when our members get in early. If you join us in celebrating CSA Signup Day by purchasing a share by February 26, we'll include a bonus week of CSA vegetables in November--meaning you'll be getting 21 weeks of produce for the price of 20. Don't miss out! Snag a share here. That being said, even if you don't become a member of our farm, we hope you'll take advantage of one of the awesome offers from the many other great CSA farms in our area. If you'd like recommendations, drop us a line!